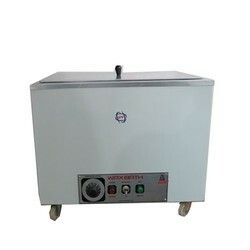 - Size: 27" x 18" x 15"
We are offering Wax bath Paraffin Dispenser with quality product and higly appreated team and product. - Construction: Double walled effectively insulated. Wax tank of 20 gauge Stainless steel sheet. Fitted with laminated wooden rim & anodized Aluminum cover Mounted on 5 cm dia Four casters. The hot bath De-wax technique is a good shell de-waxing technique. The shells are dipped into boiling-water bath to heat it and melt out the wax. The equipment is LPG fired with electrical heating as an option, built of SS with a pneumatic shell handling facility. Low running cost, good results and lo capital cost is the hallmark. Internal wax tank made out of staniless steel sheet. The top has a aluminum cover and the edges of the bath has a laminated wooden rim, works on electricity 220-240 V. Provided with special wax immersion type heater and thermostat to control temperature. Externally finished oven baked. He unit is made of inner chamber S.S & outer chamber M.S. It is used for melting the wax. Temprature is controlled from 0-100oC using thermostat. Separate indication for heater & mains on. Wooden frame on the top for safety. Our company has set benchmark in offering Wax Bath Table to the clients. Offered range is made under the guidance of skilled professionals in compliance with the set market norms with the aid of pioneering technology. Wax Bath Table is offered in different specific options in order to meet the requirement of clients. The application of heat to a specific area of the body through the use of paraffin wax. 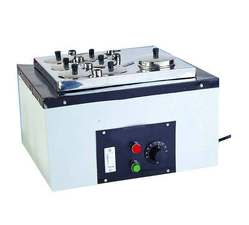 Our clients can avail from us a wide collection of best quality Hydrocolator Machine. These machines are made from high quality components.